As I was looking at Robert Motherwell’s 1959 oil Spanish Elegy, I thought of the opening of Vladimir Nabokov’s memoir Speak, Memory: “The cradle rocks above an abyss, and common sense tells us that our existence is but a brief crack of light between two eternities of darkness.” When I went on to Motherwell’s 1977 acrylic Spanish Elegy with Marine Blue, I flashed on Andy Warhol’s Campbell’s Soup Cans. Not that Motherwell’s art is remotely like Warhol’s. The Abstract Expressionist dismissed Pop as pictures for the lumpen proletariat and once compared Pop artists to mules. But Motherwell did more than 250 Elegies over a period of 43 years, and those that don’t pack the existential wallop of the 1959 Elegy can feel like iterations of the Elegy formula. Co-organized by the Dedalus Foundation, founded by Motherwell, the de Young’s Between Life and Death assembles thirteen Elegies from Bay Area collections. It’s one of several exhibitions around the country marking the centennial of the artist’s birth. Although Robert Motherwell is slotted as a New York School painter, he grew up on the West Coast, and it was in San Francisco that the seed of the Elegies was planted. In 1937 the recent Stanford graduate attended a mass rally in a Van Ness Avenue lecture hall where the French writer André Malraux, fresh from aerial bombing runs against the fascists in Spain, was drumming up support for the Loyalists in the Spanish Civil War. With his disheveled suit, his Gauloise bobbing from his lips, and his heart-stabbing language, Malraux seemed the epitome of the engaged European intellectual. Motherwell was stunned by the human tragedy the writer described. 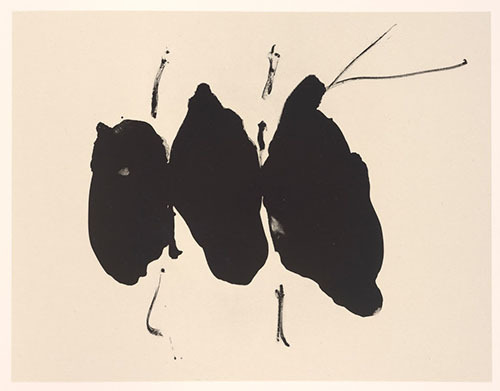 That same romantic heroism and moral urgency would inform Motherwell’s art, especially the Elegies. A lament for Spain, where the Loyalists went down to defeat in 1939, they are also a meditation on the eternal and the ephemeral, on violence, joy, agony, death and hot blinding light. Among the most powerful in the de Young’s exhibition is SFMOMA’s 7 x 9-foot oil and charcoal Elegy to the Spanish Republic, No. 57. Here, as in all of the Elegies, rough-edged vertical black bars and ovoids scaffold a horizontal field, co-existing with areas of activated white. A charcoal line runs along the bottom. A black-on-white-on-black mostly horizontal element commands the top. Behind it in one corner is a washy cinereous patch. Surfaces are rugged, and the ponderous matte blacks feel implacable. The proportions are perfect. Along with gallows, megaliths, and testicles (traditionally the bull’s testicles are displayed in the bullring after the corrida), the painting evokes the drumbeat of a funeral procession. So too does Federico García Lorca’s 1935 poem Lament for Ignacio Sánchez Mejías, a dirge for a fatally gored bullfighter. 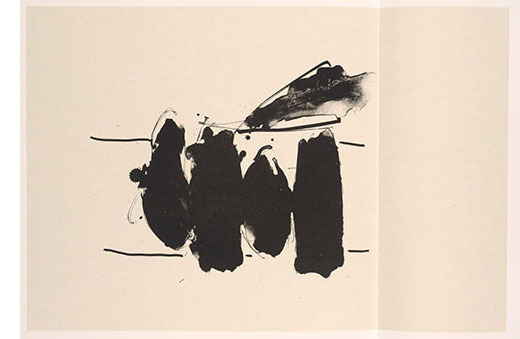 Months after Motherwell did the ink sketch from which the Elegies evolved, he realized the connection between it and the refrain in García Lorca’s poem: “at five in the afternoon.” The artist took the poet’s words for the title of his first Elegy painting, a version of which is in this show. Thus he packed more allusions into the motif: the visual echo of García Lorca’s lament, the Elegies also serve as monuments to the poet himself, who was executed by the fascists at the outbreak of the Spanish Civil War. The words belong to the critic Harold Rosenberg in the poem “A Bird for Every Bird.” Motherwell’s 1948 sketch made to “illuminate” Rosenberg’s poem had become the compositional basis for the very first Elegy. In certain Elegies over the years, “that wire” seemingly re-materializes. In Mexican Elegy it feels like a distant shriek in the hushed world of limited editions. Not only do it and Spanish Elegy evoke Rosenberg’s phrase, but also they mesh with Paz’s letterset concrete poems in the same volume, red in Spanish and black in English translation. Thus Motherwell’s ovoids are nested in poetry. That feels right for this most literary of painters. 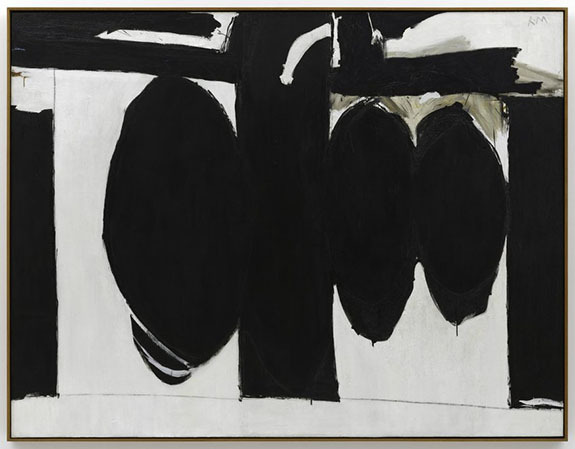 Some of the weaker works in the exhibition incorporate color, undermining the austerity, tension, and moral ambiguity vital to Motherwell’s motif. In the 1990 acrylic Untitled (Elegy) muffled blue, coral, and rust-colored forms fit behind black verticals. The painting feels doctored. In the oil Spanish Elegy Study and the lithograph Elegy Black Black, which revert to mostly black and white, the animated ovoids attest to the artist’s use of Surrealist-inspired automatism. Yet spontaneity has devolved into trademark style, passion into academicism. The void is fogged with nostalgia. 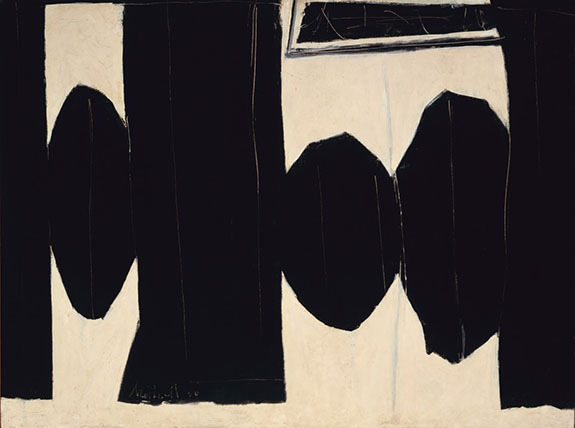 Like that of many other Abstract Expressionists, Motherwell’s art is rife with romanticism, absolutism, and machismo. It evinces an unshakeable belief in painting as an act of self-realization. Irony does not exist. Authenticity does. In other words, the work feels historically distant, almost archaic. Moreover, it has been semi-neglected in recent times, and Motherwell’s name lacks the luster of those of Pollock, Rothko, and de Kooning. In response and as befitting a centennial tribute, the organizers equip the show with a very informative wall text and an equally informative and beautifully printed four-panel glossy brochure. Yet Between Life and Death feels like a half-missed opportunity. As compact as it is, it would benefit from tighter curating. It would benefit, too, from labels that go beyond the non-committal and from a more inspired curatorial narrative. Painting as poetry should never read like prose. 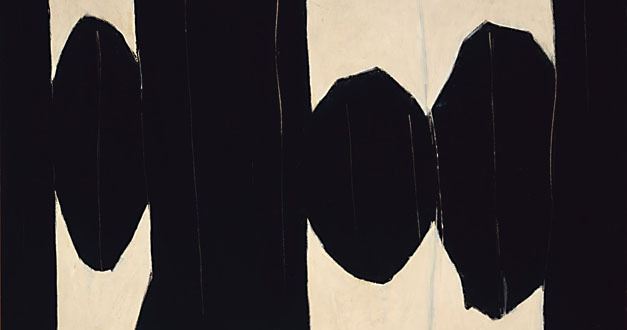 “Between Life and Death: Robert Motherwell's Elegies in Bay Area Collections” @ de Young through March 6, 2016. Patricia Albers is a Bay Area writer, art historian, and teacher. Her books include "Joan Mitchell, Lady Painter: A Life" and "Shadows, Fire, Snow: The Life of Tina Modotti." She is currently working on a biography of photographer André Kertész. She is currently working on the biography Everything is Photograph: A Life of André Kertész, to be published in 2017.